In this installment of the series, African American Music Appreciation Month, WABE’s Rose Scott speaks with classically trained pianist Avery Sunshine. Sunshine is a Spelman College alumna and is currently the choir director for the Martin Luther King, Jr choir at Ebenezer Baptist Church. In this extended interview she talks about managing a dual genre music career between gospel and R&B/Soul, the imaging of female artists and what she believes is the highlight of her career. 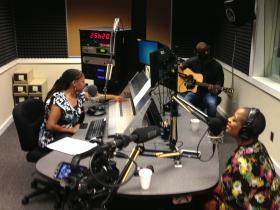 For the first time ever, Avery Sunshine and partner Dana Johnson perform a new song live from Studio Four at WABE.